Rose garden at Al-Bokhari's Mausoleum. 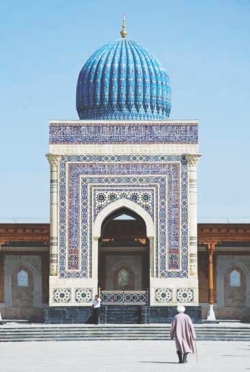 On our last morning in Samarkand, after doing the Shahe-Zinda complex, we are given a change of scene by our aesthetically astute guide, Dennis. We were not really about to ask any such question but now we nod at him intelligently. “Well, Amir Timur brought his remains, or rather, one of his arms from Iran to Samarkand.” My husband and I avoid looking at each other concentrating on imagining the whole exercise. It gets better, or worse, as Dennis continues. We also prepare to flock and are driven to the outskirts of the ancient and historical part of the city and down a pretty road past a gurgling stream. “This is part of the Siyab River,” Dennis points out. “Black river?” I ask showing off the flotsam of my Urdu-Persian knowledge. “Yes!” Dennis is beaming. “But this spring is supposed to have healing and life extending properties.” This explains the line of women and old men stooped over and collecting water in bottles at a cemented area of the tiny garden constructed along the river running by the Afrosiyab Hills. I love myths, legends and fairytales as much as I love the idea of a long and healthy life achieved through magical and short-cut means. I join the queue while my husband eye-rolls in the distance. I cup the running water in my hand and immediately feel, if not immortal, refreshed and renewed. I then return to sprinkle some of the water on my spouse, saying: May ye be healed of thy skepticism! Ironically, as we climb the steps up to the shrine, some of his skepticism seems to infect me and I start to lose part of my willing suspension of disbelief as we enter and walk around the tomb that stretches like an obelisk felled to the ground eighteen metres long! But my prayers are genuine as we rest outside under the shade of a venerable old pistachio tree near an outcropping of rocks with a view of the countryside. The sound of the bubbling brook below especially gives the place a meditative air. We say goodbye to Dennis, dropping him in town and then continue on our journey to Bokhara. 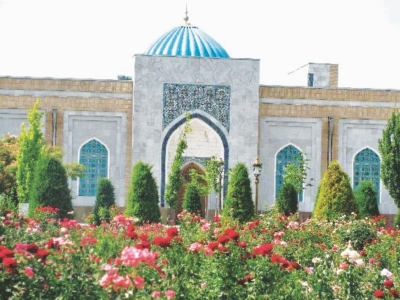 North of Samarkand and on the way to Bokhara is a sprawling garden of roses. As you walk up a path all you see around you are miles and miles of bushes all blooming with the widest variety of roses I have ever seen. At the end of the garden walk is the grand and newly constructed entrance to an old shrine. 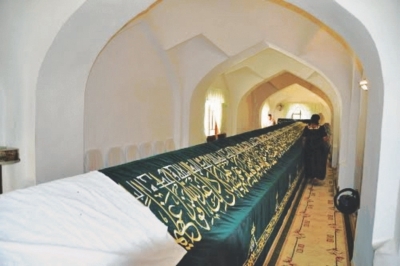 This is the resting place of one of the most famous scholars of Islam: Imam Bokhari, famous for his collection of Hadith – the sayings of Prophet Muhammad (PBUH), named the Al-Jami-as-Sahih. This is considered one of the more authentic sources of Hadith for Muslims. I had earlier requested Driver Mahmud to stop at the shrine on our way to Bokhara. I thought this would be a brief stop in which we would enter, pay our respect and leave. But the beauty of the place made us stop for longer. After spending a while at the beautifully decorated shrine within the enclosed garden, we stepped out to the rose grove outside, walked around, then among groups of picnicking Uzbek families we sat on benches in the fragrant shade and ate ice cream and wished all shrines and holy places were as well kept and peaceful as this one of Al-Bukhari, who having spent his life collecting and studying Hadises in Egypt, Iraq, and Khurasan returned home to die in this village between Samarkand and Bokhara.